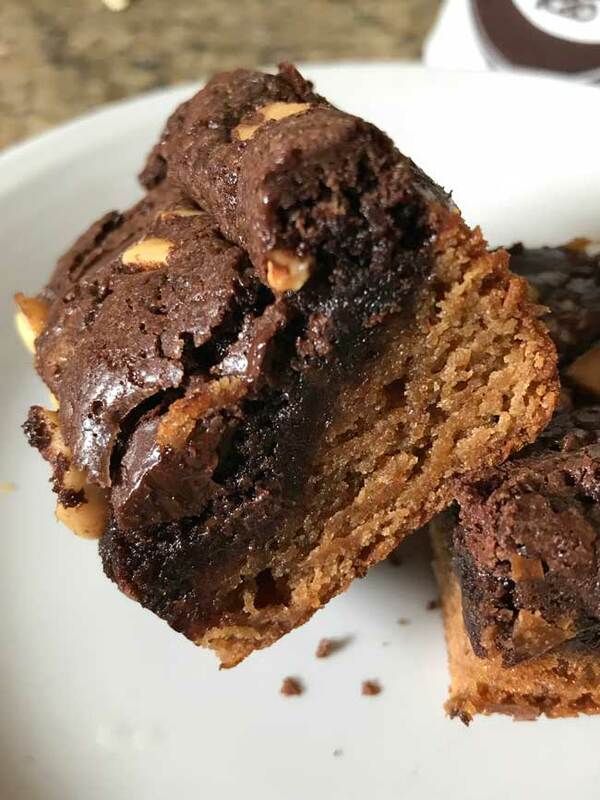 This week I tried a new recipe from Epicurious — Gluten Free Double Decker Peanut Butter Brownies. I just couldn’t resist! They combine two of my favorite flavors, plus they’re gluten-free and it’s always nice to have a few simple gluten-free recipes in the repertoire. As expected, they came together quickly and were quite delicious. The base layer is a soft, dense, peanut butter cake while the top is a very fudge-y brownie. 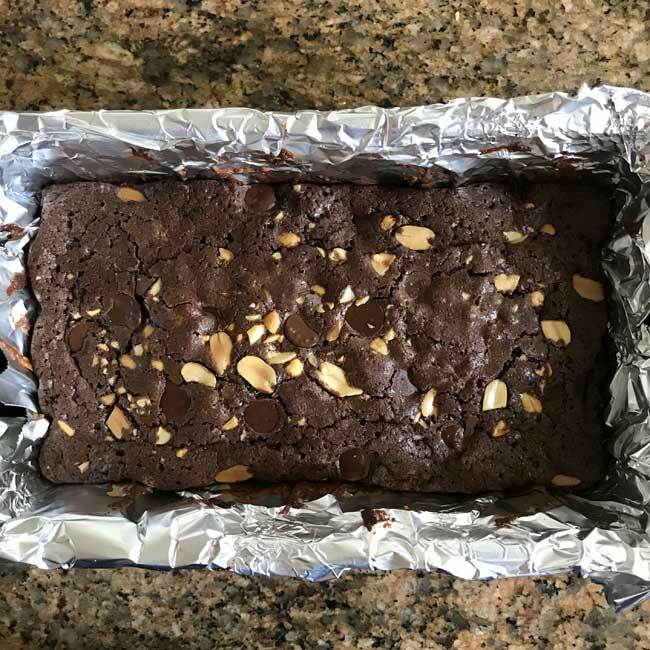 The original Double Decker Peanut Butter Brownies are baked in an 8 inch square pan, but I didn’t need a full batch so I halved the recipe and used a 9 1/2 by 5 1/2 inch loaf pan. It worked perfectly, and since the bars are so rich I was able to get about 10 squares. After making the double decker version, I wanted to see what would happen if I made only the peanut butter layer and stuffed it with lots of chocolate chunks and peanuts. So for the next round I did just that, but added in a little baking soda. The new mono-layer peanut butter squares were soft and cakey but just slightly chewy. The texture was different than normal peanut butter blondies, and the bars had a lot more peanut butter flavor. I put them in the refrigerator for a while and found they were even better chilled. 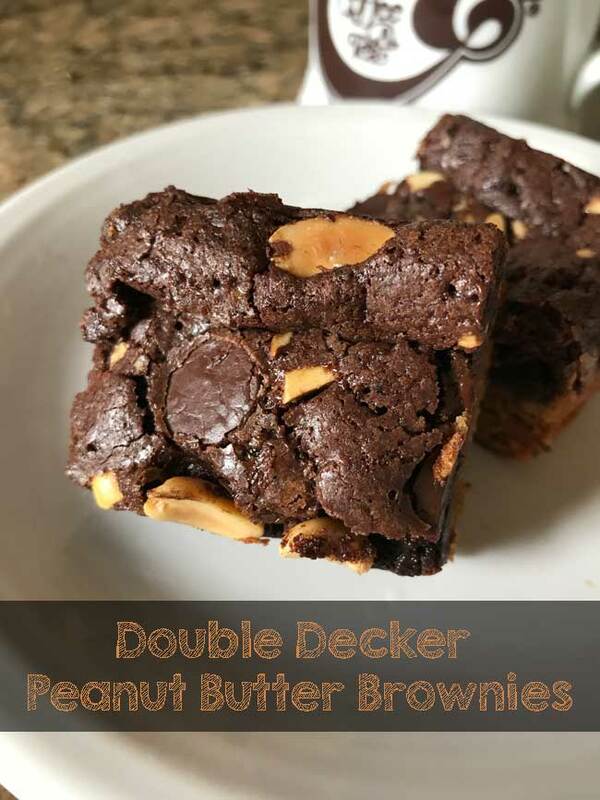 So you can make these as Double Decker Peanut Butter Brownies or if you just want something quick and peanut butter flavored, Flourless Peanut Butter Chocolate Chunk Squares. Here’s a link to the recipe on Epicurious. And here’s a loaf pan size version of the Flourless Peanut Butter Chocolate Chunk Squares. 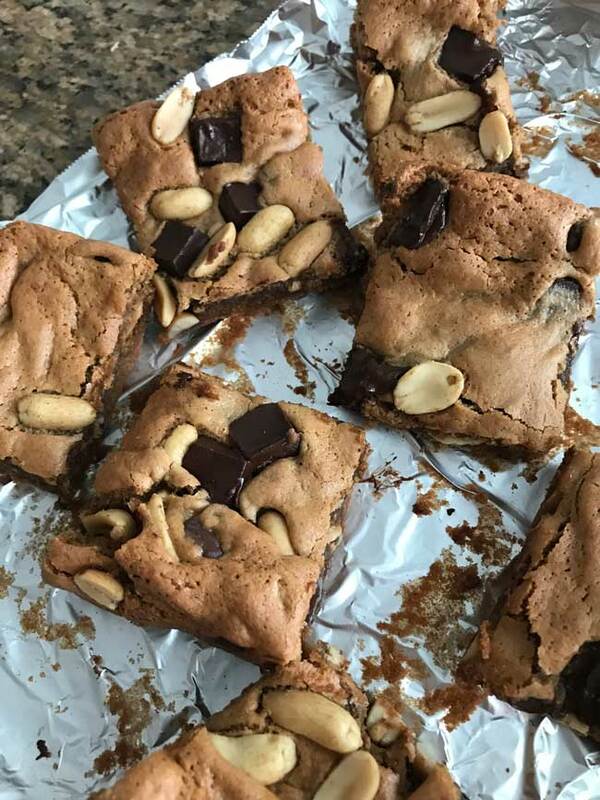 Flourless Peanut Butter Chocolate Chunk Squares are quick an easy to make, but they do taste best after they've cooled. For best results, use unsweetened peanut butter. I used Trader Joe's unsweetened. Preheat oven to 350°F. Line inside of a 9 ½ by 5 ½ inch loaf pan with nonstick foil. With a hand-held mixer, beat the egg, brown sugar, salt, baking soda and vanilla in a bowl until well blended and sort of foamy (about a minute). Add the peanut butter and beat until blended, then stir in the chocolate chips and nuts. Scrape into the loaf pan and smooth to make an even layer. Bake for 20-25 minutes or until bars appear set. Let cool completely, then lift from pan and if desired, put the bars in the refrigerator for a few hours to chill (this makes them chewier). Cut into squares. I’m interested in both of these recipes and I’m not even s huge pb fan!